There has recently been a new addition to the art room here at school. 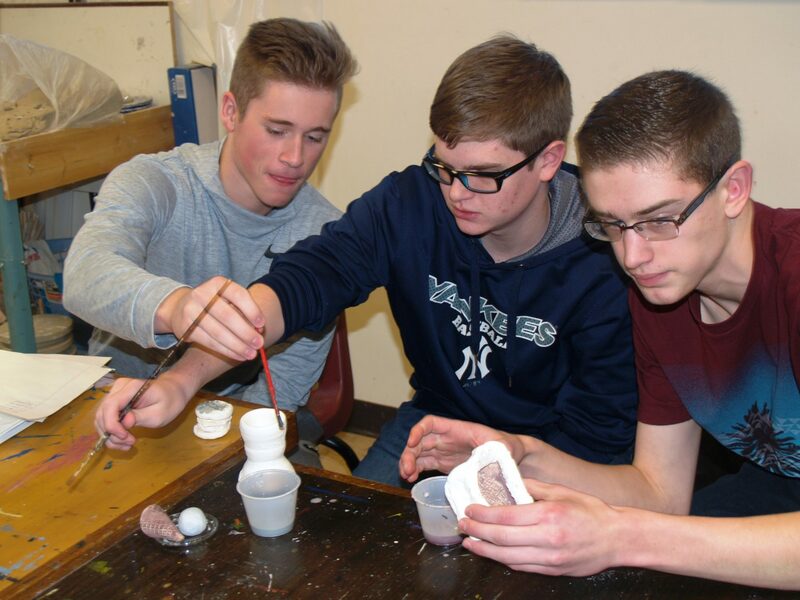 For the purpose of making the high school art unit on clay more in-depth, Mrs. Torell and Mrs. Schluckebier brought in two pottery wheels for students to experience and work on. The art teachers agreed that having a full knowledge of clay and 3D art requires some time throwing pots on the wheel. Clay is a messy and time-consuming medium, so the art teachers had to have a clear and worthwhile motive to make the effort to get the wheels here and go through the process of teaching students how to use them effectively. Mrs. Torell explained that providing another medium for the students to experience and experiment with, alone, is worth it. Having the wheels opens up a wider range of opportunity. “The element of 2d versus 3d is a different thinking process. So I think that’s important in developing your eye [to work on both levels],” says Mrs. Torell. Clay is a medium that requires time, whether that is spent learning the skill or the many steps involved in getting to the final product. When you sit down to create something with clay you first have to have a realistic idea. After you’ve either molding it by hand or on the wheel, the next step is waiting a day or two for it to dry to leather hardness. Once it’s dry it goes to the kiln to be fired. When the have-baked sculpture comes out, it is glazed with three to five layers of paint, and sent to the kiln for the second and last time. “Working on the wheel… takes a lot of practice. You have to be willing to be patient and practice and really just get into it. With hand building it’s more just taking your time and knowing the techniques and tools.” says Mrs. Torell. The school and the high school art classes specifically are really excited to have the wheels in the art room. Learning how to work with clay to create an interesting and appealing final product has been a fun and messy process for everyone involved.